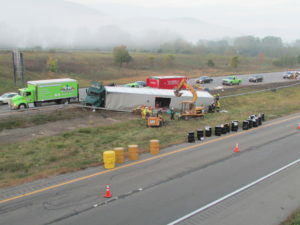 An overturned tanker trailer and a 6,000-gallon liquid asphalt spill are never a good way to start a day, but T&R responded to this accident with an eye toward safety and cleanup that would make the site look like nothing had ever happened. Our team used a vacuum truck to clean the Interstate median but quickly realized that an adjacent wetland area had also become contaminated. We used a dredging excavator and vacuum units to remove and solidify the contaminant and dispose of it properly, then cleaned and restored all drainage channels and roadways to pre-incident condition. This project also came in on schedule and UNDER budget. A nitric acid spill at a local industrial facility required our team to respond with full SCBA/PPE for assessment and remediation. We set up a 412 Code vacuum truck with vapor scrubber and began removing the contaminant from the affected area. A full cleaning of the facility was required, which then exposed a serious leak in one of the tanks. Air testing indicated that initial repairs to the gasket had not contained the leak, so our team repeated the repair and stayed on-site overnight to do regular monitoring and air testing. A multi-day waste load transfer process then began, with the tank ultimately being cleaned and safely returned to service.